I'M IN LOVE, OH MY! I am smitten, I am in love. And she is a character! A real character. 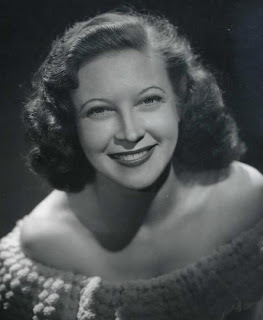 Her name is Effie and she is a character in the radio series of "The Adventures of Sam Spade". Miss Tuttle was a very accomplished character actress whose career spanned from the days of Vaudeville to Broadway through the golden age to radio and finally TV. I had never heard of her until I began listening to all the radio episode of Sam Spade. When I research a little about her I was amazed at just how accomplished she was. She worked often and on a variety of shows. We probably all have seen or heard her in things on the radio, years ago, or on TV in more recent years, never knowing her name. Such is a fate of a journeyman character actor in an industry that focuses on "Stars". Her fellow actors knew her and appreciated her. She even tutored and mentored some of them, like Helen Hunt. Sam Spade was the usual private detective character, who is tough, insightful, clever, gruff at times and of course a lady's man. Today, he would be rcognized as a charming chauvinist. The show would soon become tiresome if it were not for his delightful secretary, Effie Perrine who always ads charm, and humour to balance the detective character, played by Howard Duff. Effie speaks with a child like voice which often reveals a vulnerability and gullibility. She is an efficient and ever attentive secretary to Sam Spade ready at a moments notice to record the events of his latest case; but not always without her two cents worth of comment. After a while you realize she is smart and insightful although she often slips into language humour (with I love) with malapropisms, double entendres and puns. Always to the delight of Sam Spade. I have yet to decide if this is intentional or deliberate for she always get a positive reaction from Spade when he catches her up on these language "errors"
Being a bit of a sucker for a woman in distress and vulnerable ,I soon came to really enjoy Effie and often listened to the programs for the parts of the show at the beginning and end with her present. Often I was suprised and delighted at some new slant to her involvement as the secretary to Sam Spade. I now have listened to all the Adventures of Sam Spade. From time to time I will no doubt return to just renew my love for the character Effie. With the tragic circumstance of the people of Haiti we are reminded that while we all live and share life together on Mother Earth , we do so very unevenly in sharing in benefits she has to offers. While a few people and Nations have prospered and come to exploit our island home in the Universe, most seem to struggle just to survive. It is like living in a house where some family members are forced to live in the unfinished basement and attic, or even the tool shed outback, ( the Restavec of the home)without enough of the benefits of being a member of the home to live and grow to their full potential. It is an outrage. If it were a house in our society, the authorities would intervene in the home and rescue the children and bring succor to the handicap and the elderly. Those who have everything and fail to share it sufficiently would be prosecuted for their neglect of family members. Life is not fair is a cliche but a true observation. But there is more we can do to make it more fair for all while still being able to celebrate the rich diversity of human culture. These thoughts, which often haunt me. The plight of others in our World reminded me of the Miniature Earth Project. , which I have saved on my computer for several years. This is a project that tries to explain the nature of our World in a way we can better understand it. In their project the World is reduced to 100 individuals so that we can better understand the reality of our circumstances in it. The Project has been around since 2001. The information has been updated. Take a moment and watch this most interesting presentation. There are several versions of this on You Tube. I chose the one that uses John Lennon's music. I find most of the time the music gets in the way. What is wrong with silence? I prefer the haunting tones of the original you can link to above. Its impact needs to be experienced while being alone with one's thoughts. It seems Haiti just cannot get a break. It is the basket case of a nation in the Western Hemisphere. Such a sad situation for this interesting Nation, which began as a country in such a glorious fashion. Slave revolts defeated the greatest military of the day, Napoleon's Army, to become the first Demoncratic Independant Republic in the Hemisphere. It's history ever since has been on a downward slope, often due to events beyond it's control. It has been regularly interfered with by external racist forces, largely the United States, which actually occupied it early in the 20 Century and left it no better off. It has had long periods of dictatorship as was the case under the Duvaliers. And, of course, it is frequently the victim of natural disasters, usually Hurricanes, the last two of which it is still trying to recover. Most recently, its democraticly elected government was overthrown. It was the little remembered regime change engineered by the US in the midst of its wars in Iraq and Afghanistan. This coup was organized in conjuction with Canada. It seem Canada was moving away from its proud tradition of peacekeeping . Under the Consevative government it moved to imitate the US and become a militarily inteferring Nation. Briefly, US marines forceably removed Jean-Bertand Aristide, the democratically elected President, while Canadian special forces secured the airport. Armed thugs who were former military soldiers and/or members of the feared tonton macoutes were allowed to enter the country and execute the coup. Canada and the US more or less left the UN to try to pick up the pieces and aid Haiti with peacekeepers. Canada has had some role in peacekeeping and RCMP training of the police in the country. To this day, I can find no substantial reason for Canada and the US bring about a coup in a sovereign neighbour country. The Canadian government like to speak of Canada being a friend of Haiti. Most Canadians do no gag or gasp when they hear this because most are not aware of Canada's direct involvement in the coup. Canada has taken in a lot of Haitian refugees who have largely settled in the Montreal area as they speak French and Creole. Haitians have come to be a part of the ethnic mix of Canada enriching our culture from hockey to the Governor General. This recently current earthquake disaster is absolutely devastating to this small island nation. The Capital city has been laid waste with near total destruction. Other cities and rural areas as well. Its infastructure was weak to begin with , now it is nearly non existent. Ten's of thousands of people will die, possibly hundreds of thousands unless there is a massive rescue effort and an even more massive effort to feed, house, get clean water to the people and rebuilt the Country. It appears the effort necessary is getting cranked up quickly. The US, who is in the best position to do the most quickly seems prepared to do so with Bill Clinton as the special envoy of the UN in Haiti. I hope the US answers the call better than they did for the people who suffered, and continue to suffer from Hurricane Katrina. One wonders how sustained a commitment will be to a poor nation of black people who don't even speak English (if I sound a little cynical, I am). I seldom give the Canadian Conservative government under Stephen Harper, much praise but I do think they have acted quickly this time. Could it be because they must sit across the table from our Governor General Michaelle Jean, is Haitian by birth, and discuss what aid Canada can offer. It would be hard to not do our best in such a situation. So far I read that the military DART team is on its way. This unit sets up a military hospital and water purification unit that can produce enough potable water for 50,000 people each day. Two Canadian ships , with supplies are on their way to help. Some helicopters will be available and some military forces members. The Canadian government has contributed seven million dollars and agreed to match Canadian individual contributions dollar for dollar. Canadians are generous so this may end up a large cash donation. This is all a credible beginning. With other Nations around the World doing what they can, maybe, just maybe, Haiti can be stood up on its feet again within a reasonable time. It is very moving to hear The Right Honourable Governor General Michaelle Jean react to this disaster with her public statement . She addressed all Canadians in French then in English. She then offered , in Creole,words of condolence and encouragement for courage once again to theHaitians, in Canada and Haiti. For those who don't want to hear the French portion of her address, here is the English portion on You Tube. As a Canadain, I am offended that on You Tube the address was split in two. Canada is a bilingual country and when the highest symbol of Canada speaks we should listen to the address in both official languages. To hear her whole address open the Globe and Mail webpage above. Go here for the BBC list of Charities to use to donate money for the people of Haiti. Radio Netherlands and Deutsche Welle, ABC (Australian Broadcasting Corporation). I am not a fan of all music and 24 hour news stations. I love old time radio too. I have a small collection of old radio shows that you can purchase on cassettes, like my boxed set of "The Shadow". Well a couple of months ago I found an old time radio gold mine and I have been mining it regularly. It is the Internet Archives. This is not only a resource to hear old time radio but also gives you access to millions of books, in both print and audio form, music, films, commercial and home movies, old Internet sites, and much more that is no longer protected by copyright. It is the old time radio that interests me the most. I have listened to nearly all of the more than 500 espisodes of "Yours truly, Johnny Dollar." Those of you who remember this radio show may remember that it was broadcast each day for 15 minutes. Each week's five broadcasts made up an episode. The most popular actor who played Johnny Dollar, Bob Bailey, previously played in a similar show "Let George Do It". I did not remember this show but I am now listening to its episodes, not quite as gripping as Johnny Dollar. Needless to say there are many other shows that I have dipped into, The Adventures of Philip Marlowe, The Great Gildersleeve, Amos and Andy, Our Miss Brooks, The Lone Ranger, Phil Harris and Alice Faye, Jack Benny etc, etc ,etc. I obviously have too much time on my hands. No wonder I am falling behind in my reading. I am now working my way through the Lux Radio Theater shows. These radio dramas were read by the leading actors of the day and hosted in the early shows by no other than Cecil B. DeMille. I believe these shows even had audiences early on with leading hollywood people in attendance. After the drama the lead actors along with others who worked in the business were interviewed. Usually, the actors doing the radio drama had done the same part on the stage or in the movie. I think the radio shows were a kind of advertising for these other presentations. Speaking of advertising, some of the most fun on listening to old time radio during the golden age of radio (before TV) is listening to the ads. Like when was the last time you heard an ad for coal, or the first refridgerators,to replace the ice box, or new automobiles for $500. The ads were worked into the show. On Lux Theater, they very cleverly worked in the ads for lux soap. There was none of this breaking for a commercial. The commercial was a part of the pre and post drama patter. Now to get a little political, (my commerical.) I have been listening to the dramas during the second world war. There are ads to sell war bonds and stamps. It was a patriotic duty in the US and Canada ,I believe, to purchase these to fund the war effort, along with rationing and saving strategic materials to recycle. The target was 10% of your weekly pay to purchase war bonds. The entertainment industry was organized so that the heads of studios and actors down to lowly grips who fetch and carried on sets bought the bonds. I am sure all industies were so organized. It was a remarkable effort. It was a different day and age with different values. People had just come out of the Great Depression. People wanted nothing more than to pay their way and not incur debt. They did that back before the 1929 Crash and look what that got them. So WW II was to be paid for by borrowing money from the people of the country. At least, this debt was to ourselves. There was no thought of borrowing from off shore sources, if there were any, for the wealthy countries of the world were busy paying for their own war efforts. How different this was from the attitude toward the funding of the present wars by the US and Britain and even Canada in Afghanistan. The attitude is that if this is something you want and need now just put it on the credit card and pay for it later. The US has funded two very expensive wars on credit borrowing from China and Saudi Arabia. The people of the country have not been asked to make any financial sacrifice. They will be passing on this debt for their grandchildren and great grandchildren to pay. How values have changed. In spite of my left wing political convictions, I am conservative enough to think that one should pay for what he needs and wants without incurring long term debt (except for a house mortgage). I do not have a credit card. I use the Queen's currency.(cash). When I did use a credit card I paid it off each month for years. Then, I thought I could finance a small business on it and had to learn my parent's lesson the hard way all over again. Keep within your means and pay as you go was a lesson I learned from my parents who lived through the Great Depression. I have argued several times in blog entries and to friends who would listen that the US should do three things: 1. Have a law that when war is entered into, automatically, a war surtax goes on other taxes to pay for it. 2. Immediately, corporation's profits should be regulated so war profiteering by suppliers is prevented. 3. There should be a law that requires able-bodied men and women among the federal politicians and their direct family members down to their grand children, to be required to join one of the military services. That President Bush's two daughters did not sign up and do their patriotic duty after their father declared the country at risk and at war , ( a lie of exaggeration should be an embarassment to the US. (If the British Royal Family members can sign up as their duty, surely American "nobility" could also.) If these three things happened the country and politicians would be slower to agree to send other people's children off to die for their country, (usually it is the poor and immigrant community that do the dying). The sacrifice would be more evenly shared. This is the end of the commercial. I slipped it in because the war bond ads of old time radio got me thinking about it again. I recommend the Internet Archive to you for boundless access to interesting information and entertainment in many forms. "Yours truly, Philip Two Cents." I must be getting sentimental in my old age. Today, is Elvis Presley's birthday. He would be 75 years old. How old does that make you feel. He was influential in my youth without a doubt. But I am more mindful now than then of Rompin' Ronnie Hawkins. He was born two days after Elvis. He is still with us, bless his soul. Ronnie Hawkins, the Hawk, was born a son of Arkansas, and as a young Rockabilly singer found his way to Canada with his band, "Ronnie Hawkins and the Hawks,I am surprised a country boy from Arkansas even knew where Canada was, or if he did he thought of it as a land of ice and snow. It was Conway Twitty who told him he should come to Canada. He came and fell in love with Canada and stayed. He first performed in Hamilton, Ontario and then moved to Toronto, where he made his home. In my youth, he was a regular performer around Toronto and a fixture at the club, Le Coq d'Or. The Hawk has become an musical icon in Canada and much loved and admired by his fans here. He has contributed to Canadian culture not only by his performances but but the number of many young Canadian musicians he has seen pass through his bands over the years. When all the original Hawks returned to Arkansas, except for Levon Helm, he hired Canadian muscians and helped them develop into great rock and roll muscians . The most famous group that moved on from Ronnie Hawkins was the group know simply as "The Band" lead by Robbie Robertson. But other musicians moved on singly and in groups to join other bands. One group in particular became the band for Janis Joplin, (bless her tormented soul) one of my favourites. 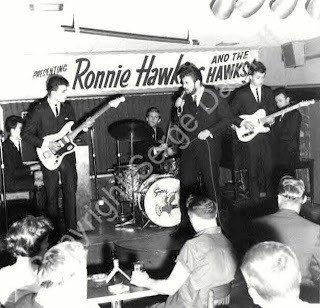 Ronnie Hawkins and the Hawks as they were when they came to Canada, in my youth. When Elvis Presley went into the army, Ronnie Hawkins was approached to return to the United States to step into the music vacuum left. He refused. Canada was his home. One of his admirers is former President Bill Clinton, the musician, that other son of Arkansas, who has also succeeded in life while occasionally being a bad boy. Hawkins played at Clinton's Inauguration. 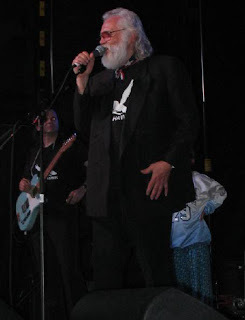 And when Ronnie Hawkins was supposed to be dying, Bill Clinton came and performed at a Concert to honour him. Being too tough to die, Rompin' Ronnie Hawkin, miraculously recovered from his pancreatic cancer and is still with us. His birthday is January 10. It is so nice to have him still among us to occasionally charm us with appearances on TV and remind us we were young once. Here he is singing Mary Lou, one of his signature songs. He can still get your toe tapping, hands clapping and heart pounding. Here is Ronnie Hawkins in an interview with George Stroumboulopoulos talking about his recover from a teminal cancer. It is funny as he displays all his rought charm. Hearing the New Year's Greeting in 32 languages is interesting and a reminder of the rich diversity of human society. This is just a fraction of the cultures represented by their language. Sadly, many languages round the World are under threat of extinction. Human society's diversty and richness is forever diminished with each lost language. The very way the World is experienced and interpreted with understand uniquely in a language is lost. Well! I am home again from my post Christmas trip to the balmy South. That is Southern Ontario, actually the Toronto area. It was a very nice visit with family and friends. I even got to stay a little longer when I discovered I would have to come home on the train. After almost missing the train in the transfer in Toronto's Union Station, I found the train North full. This train is seldom full it is a subsidized passenger service of the Government, Ontario Northland Railroad. This is the rail road the opened the Northeast of Ontario to settlement and mineral exploration. The Northlander train travels north to Cochrane Ontario where the road North ends. From there you can continue on on the Polar Bear Express to Moosonee on the James Bay coast, travelling cross the Hudson's Bay Lowlands. I was thinking of this as I road the train and read my Christmas book, Fatal Passage, about the Arctic explorer, Doctor John Rae, which I mentioned in the previous post. He was the doctor, for the Hudson's Bay Company, at Moose Factory on the island in the mouth of the Moose River 12 miles from the mainland town of Moosonee. Moose Factory is one of the oldest settlements in Canada, about 400 years old. It was a major fur trading post for the HBC when it had the rights to trading in Rupert' Land (all the watershed of rivers draining into Hudson's Bay. This included 40% of what is now Canada and part of the territory in what is now Northern Central United States. It is a facinating read about a remarkable man. The train ride went by quickly. I don't know if I fell asleep during part of it or was enjoying the book but the 5 hour trip came to an end quicker than I thought. The train passed through the snow belt area which has had a couple of major snowstorms this year already. They have more than 3 feet on the ground. The land was white and the evergreens stood out in contrast being also tipped in white. I can image travelling by train more in the future and after two such trips it does not seem to be so daunting. Maybe next time I will find the courage to venture into the dining car. I bet you didn't know I was a shy guy! I got a couple of books for Christmas from my friend in Mississauga. She gave me John Irving's latest book, Last Night in Twisted River, which I expressed an interest in a while back. It caught my imagination because the story and Irving, an American author, has connections with Toronto and the Georgian Bay vacation country coast, which is not far from here. I am a little familiar with it. It should be a interesting story written by a skillful author. 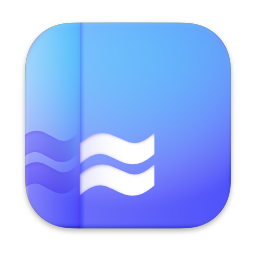 The other book, Secret River, by Kate Grenville appealed to me interest in rivers both in reality and as a metaphor of life. It is a story based on some of her family history. The main character in the book is sent to the penal colony in Australia with his family after being convicted in England for stealing to feed his family there. (In the age of Dickens' England). In short, he serves his sentence and earns his freedom. He takes his family up a river to homestead on a piece of property. It is the story of their experience and their relationship with other homesteaders and an aboriginal population that feel they have ownership of this land. I look forward to reading this book also. My reading is starting to back up. It would be a lot easier to get it done if I didn't have a computer. I am tempted to dedicate some specific hours of the day to reading: perhaps between 4:00 AM and 8:00 AM since I am up early most days. I just might try it. We went to see her and share a celebratory meal with her and her family. Her four grown children were able all to be there, which is a rare event as one lives in Montreal and another lives in London, England. The star of the occasion was my sister's first grandchild. He was born this past year and is a sweet charming little person who obviously has filled the whole McArthur tribe with joy. I don't know what I was thinking but I didn't even take a picture. I was just icing on the cake. I can't remember when I last celebrated her birthday with my sister. In fact, being bad at keeping track of such things and it being so close to Christmas and New Year's Day, I usually forget to even send a card. It was a really nice visit. I am sure it will be a memorable birthday for her. I hope the year ahead brings her more interesting times and good health. Well, the New Year will offer challenges to all of us. I hope everyone is up to the challenge and has a year full of interesting things and people with whom we enjoy spending time. To everyone I wish you a Happy New Year.